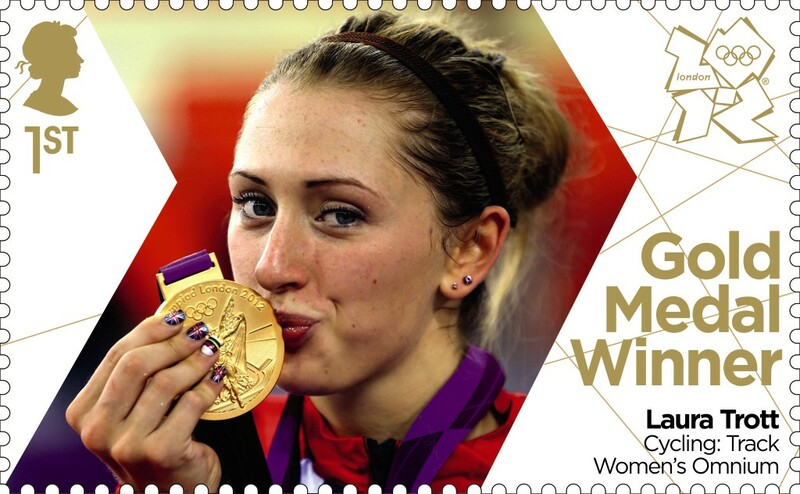 Gold medal stamps continue to flood out of Royal Mail's printers! Britain's Alistair Brownlee won a brilliant Olympic triathlon gold with his younger brother Jonny in bronze as Spain's Javier Gomez took silver. Britain's best gold total since the London Olympics of 1908 came courtesy of a dressage team of Carl Hester, Laura Bechtolsheimer and Charlotte Dujardin. Laura Trott won a superb second gold medal of the Games with victory in the women's omnium. Having claimed gold in the women's team pursuit on Saturday, she is now a double Olympic and world champion at just 20 years of age. 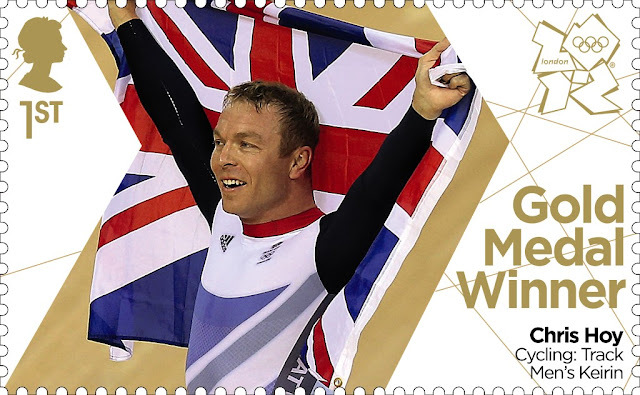 Chris Hoy claimed a sixth Olympic gold medal to become the most successful British Olympian of all time. Having won gold on the first night of the track cycling in the men's team sprint, Hoy's triumph in the keirin was the perfect finale for Team GB. I guess their stamps would get withdrawn as happened with the Greek Weightlifter Sampanis in Athens 2004. Tip for storing your GMW mini sheets: I have just purchased Prinz 'Texas' Black stock sheets, extra wide format, 3 strips - each 79mm high x 240mm wide. Perfect for these stamps. ... and A4 sheets can be stored in Royal Mail's Smilers Album pages. How are the 1000s of young, keen stamp collectors going to get their complete set of single GMW stamps?. Are their parents going to buy all the mini-sheets then carefully, with their kitchen scissors, cut out a single stamp or will a child have wait for a stamp dealer with their guillotine, to make up sets for sale?. Why couldn't the Royal Mail have printed 'Counter Sheets'. 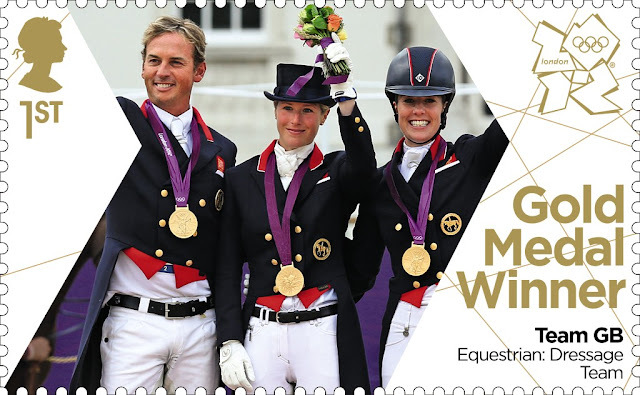 After all, the London Olympics was a fantastic opportunity for the Royal Mail to encourage 1000s youngsters to take up philately instead of spending their lives texting or playing on their hi-tech gaming consoles. An opportunity lost, I think! I wouldn't be at all surprised if Royal Mail doesn't issue some kind of Composite Sheet after the Games have finished which features a single stamp of every Team GB Gold Medal Winner, rather like the similar sheets already issued for the 30 Olympic Sports stamps and 26 A to Z of Britain stamps sets. They could even put on a premium to let collectors contribute to UK Sport. I hope someone at Royal Mail is reading these comments/blogs!...probably not. They certainly read the blog; whether they read the comments I don't know. 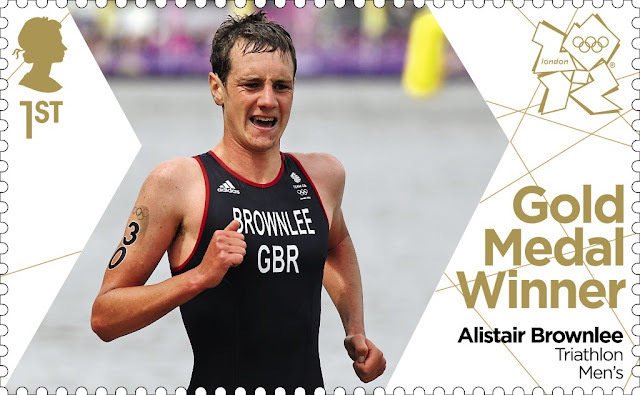 Thurs 9th August 2012 - Today the Daily Telegraph's 'Telegraphplus' supplement has the story of the production of Alistair Brownlee's stamp. The reporter explains how just three hours after Alistair crossed the line, 200,000 stamps bearing his image had been printed. (The report does not make clear whether the 200,000 was just at the printing site the reporter visited or referred to the overall total). The digital image was made available to printers and the media (including us) just over 2 hours after the event finished, at 15.28, which was nearly an hour ahead of the target time. 200,000 stamps is only 8333 sheets of 24, so probably only at the one printer. Relatively new to collecting and this site so don't know if this has been answered but are there any ideas of how many mini sheets of each stamp are being printed or if levels will vary from one athlete to another depending on their popularity? Royal Mail don't release any details of how many stamps are printed or sold. My guess is that they will print the same quantity of each athlete unless there is a very good reason for printing more - for instance if a customer wanted a 4-figure quantity of one athlete. But that's a pure guess. I am sure I read that single stamps would be available - but my local post office will only sell them in sheets of £3.60 each. You probably read it here. POs were told that they could sell singles from the MS, but demand for MS has been such that many have been able to sell whole and not split. On the other hand some people have reported being able to acquire singles. RM seem to be selling the GMW MS's via their website - did I miss something? I thought it was 'next day delivery' to PO's only. Does this mean they are printing a second batch for Tallents house? RM have been taking subscriptions for the GMW MS since April, and advertising them widely in the press, and all their own publications. There will be supplies - of whole MS only, not singles, from Tallents House and - exceptionally - next day delivery to 500-ish POs. There are weekly deliveries to 4500 more POs, but these supplies are of small quantities if reports are anything to go by. Our village office has 8 MS for each medal. POs located in winning athletes home towns will get more, because of local interest.